Israel says it will speed up Jewish settlement construction in the West Bank and East Jerusalem - and temporarily freeze the transfer of funds to the Palestinian Authority. The announcement comes a day after the Palestinians won full membership of the UN cultural organisation, Unesco. Palestinian Authority President Mahmoud Abbas says the move will speed up the destruction of the peace process. The Israeli government has described the Unesco vote as a "tragedy". A spokesman for the Israeli foreign ministry, Yigal Palmor, told the BBC the measures were designed to increase pressure on the Palestinians. Mr Palmor said they were "a response to unilateral measures aimed at confronting Israel at the UN and elsewhere on the international scene". "They [the Palestinians] shouldn't be wasting time by all these manoeuvres. They should continue to negotiate," he said. The Israeli government said Prime Minister Benjamin Netanyahu had called for the accelerated construction of about 2,000 housing units. It said the construction will be in "areas that in any future arrangement will remain in Israel's hands", according to a statement quoted by Reuters news agency. The BBC's Kevin Connolly in Jerusalem says the announcement will be seen as a punishment for the Palestinians and a warning to countries that backed their Unesco bid that Israel will react strongly if a similar application for Palestinian membership of the UN itself should prove successful. Peace talks between the Palestinians and Israel broke down more than a year ago. 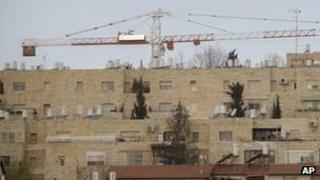 The Palestinians are demanding an end to settlement building. The Palestinian presidency said the decision to speed up settlement construction amounted to a decision to "speed up the destruction of the peace process". Image caption Unesco is the first UN agency the Palestinians have sought to join since submitting their recognition bid. Nabil Abu Rudeina, the spokesman for Mr Abbas, said the decision to withhold funds collected by Israel on behalf of the Palestinian Authority was "stealing money from the Palestinian people." It will be the second time this year that Israel has withheld the revenues it collects on behalf of the Palestinian Authority. The money, which include duties on goods being imported to the Palestinian territories, amounts to about $100m each month - half of the PA's domestic revenue base. Israel withheld the revenues earlier this year after Mr Abbas concluded a reconciliation agreement with Hamas, the Islamist group that controls Gaza. The United States announced it was cancelling funding for the UN cultural body Unesco after it voted on Monday to grant full membership to the Palestinians. Membership dues paid by the US account for about a fifth of the organisation's annual budget. Unesco is the first UN agency the Palestinians have sought to join since submitting their bid for recognition to the Security Council in September. The UN Security Council will vote later this month on whether to grant the Palestinians full UN membership.